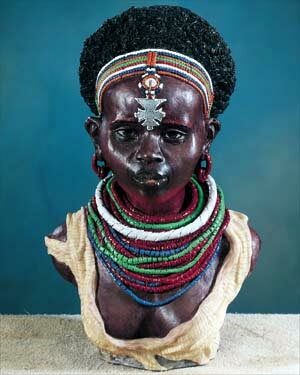 Samburu Woman: Samburu men believe that Samburu women do not have enough beads until their necklaces support their chins. By the age of sixteen young women should have garnered enough beads to inspire a marriage proposal. Unlike the Moran, the Samburu women are raised within strict confines. Perfect for gifts and collectables.